One of YouTube's most popular golf coaches and a former Rugby World Cup winner are among the participants in next month's prestigious - and completely sold out - Messinia Pro-Am, at Costa Navarino, the prime sustainable golf destination in the Mediterranean. The third Messinia Pro-Am - a four-day PGAs of Europe-sanctioned event, in association with the PGA of Greece and the Hellenic Golf Federation - takes place on the Dunes and Bay courses at the destination in Greece's Peloponnese, and is drawing in professionals, celebrities and amateurs from across the world. Finch has more than 170,000 followers on his YouTube channel, where he posts free golf tips, drills and advice. As well as acting as host at the gala, he will also compete in the event as a professional. He said: "I'm very excited to play in Greece for the first time, especially at such an incredible looking venue. To compete in the event, soak up the atmosphere and capture some awesome content is something I'm very much looking forward to." Participants will be able to enjoy the mild climate of the region, the unspoilt Mediterranean landscape and play golf surrounded by centuries old olive groves and rolling hills overlooking the Ionian Sea. Event partners include AEGEAN Airlines, a member of Star Alliance, which is the official airline of the tournament, and Erasmus, the official travel partner, which is coordinating and ensuring a smooth registration and accommodation process. One of the world's most sustainable destinations, Costa Navarino is renowned for its pristine coastal location, breathtaking landscape, cultural heritage, luxury hospitality and real estate. A commitment to the highest standards of environmental and social responsibility exist throughout its operation, as well as a desire to promote the entire region of Messinia, while protecting and preserving both its natural beauty and heritage. 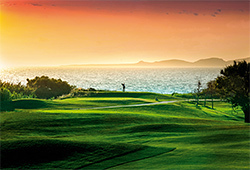 The four-day Messinia Pro-Am takes place at Costa Navarino from February 20-23. Follow the event on social media with the hashtag #MessiniaProAm. To view a preview of the 2019 Messinia Pro-Am please click here. Costa Navarino is the prime, sustainable destination in the Mediterranean, located in the Greek region of Messinia in the southwest Peloponnese. One of the most unspoiled and breathtaking seaside Mediterranean landscapes, this area has been shaped by 4,500 years of history. Its philosophy is driven by a genuine desire to promote Messinia, while protecting and preserving its natural beauty and heritage. It will comprise a number of distinct sites featuring five-star deluxe hotels, luxury private residences, conference facilities, spa and thalassotherapy centres, signature golf courses, as well as a wide range of unique year-round activities for adults and children. Navarino Dunes, the first area, is home to two luxury five-star hotels, The Romanos, a Luxury Collection Resort, and The Westin Resort Costa Navarino; Navarino Residences, a collection of luxury villas for private ownership; and The Residences at The Westin Resort Costa Navarino - fully furnished resort apartments for sale; the signature golf course The Dunes Course; Anazoe Spa, a 4,000m2 spa and thalassotherapy centre; the state-of-the-art conference centre House of Events; specially designed facilities for children; and a variety of gastronomy venues, sports, outdoor and cultural activities. Navarino Bay, the second area, is home to the signature golf course, The Bay Course. Navarino Hills, with two 18-hole golf courses, is currently under construction, and there are two further sites underway. High-resolution images of Costa Navarino may be downloaded from here.